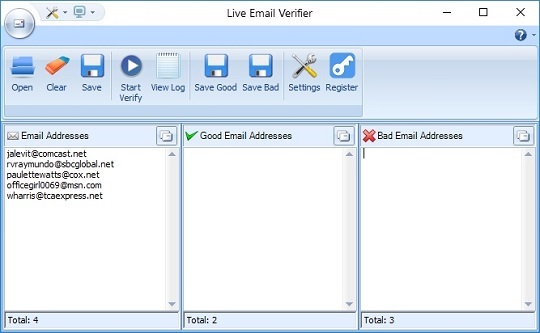 "Email Verifier Lite is an easy to use and at the same time powerful solution which will help you to optimize your email marketing campaign, in order to make it more efficient and therefore to save your efforts, time and money." 3. Support Import From : Text, Word, Excel, Access, Html, Dbase, Foxpro, and etc. Email Verifier speeds up considerable the process validation. The utility makes it possible to remove about 80% of "bad" and invalid e-mail addresses. This program works exactly as an SMTP Server: it extracts MX-Records from a DNS Server. It simulates the sending of a message. It is essential to remove undeliverable email addresses and keep a clean mailing list. It is important to keep your mailing lists clean. List hygiene will help you avoid sending out newsletters to invalid addresses. Otherwise you'll get tons of bounced messages. It's not a secret that ISP mail servers can block senders' IP for recurring sending to invalid email addresses. Make sure you have access to SMTP 25 port. In case you work under a firewall, you have to use socks proxy server. Pay attention that the speed may vary. The speed depends mostly on your Internet connection and your computer. Some firewall, antivirus or security software as for example Norton Antivirus, Panda, Zone Alarm, and other can reject access to the Internet. First, let Email Verifier get connected to the Internet. If you need advanced email verification solution read more about Email Verifier.